White Rodgers MERV 10 media filter FR2000U Type 108 16x25x5 / Box of 3 filter for $99 Only ! 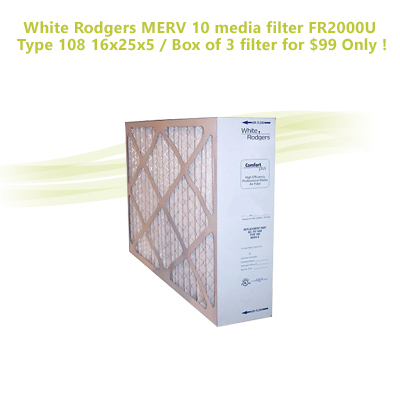 Home > Air Filters > Air Filters By Model > White Rodgers > White Rodgers MERV 10 media filter FR2000U Type 108 16x25x5 / Box of 3 filter for $99 Only ! 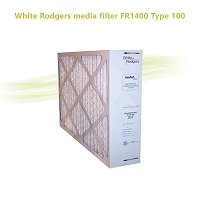 Measures 20" x 24-1/2" x 4-3/8". 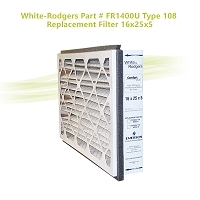 White Rodgers / Skuttle F000-0448-001 Replacement Filter for ACM 16x25 Filter Cabinets.